With a more powerful engine, refreshed styling and modern-day equipment, the 2019 Maruti Suzuki WagonR has been launched in India at an ex-showroom price of ₹ 4.19 lakh for the base LXi variant. Based on Maruti Suzuki's new and acclaimed 5th-gen Heartect platform (which already underpins the new Baleno, Swift, Dzire and the Ignis), the 2019 WagonR sports bigger dimensions as it is now wider by 145mm and offers longer wheelbase by about 35mm. Despite retaining its boxy proportions (which have been associated with the WagonR ever since its debut in India in 1999), the third-generation of the WagonR gets new styling elements in the form of dual-split headlamps, a wide C-pillar design of course, a new, bolder face thanks to a chunky chrome strip on the new architectural-design grille. Making use of the new platform has also resulted in a significant weight loss of about 65kg over the outgoing model. For the first time, the WagonR has been introduced with multiple engine options. The engine choices include a 1.0-litre K10B three-cylinder petrol motor (22.5 km/l) which generates close to 67bhp and 90Nm of torque and a higher-spec 1.2-litre K12M four-cylinder petrol motor (21.5 km/l) which generates a greater power output of around 82bhp and 113Nm of torque. 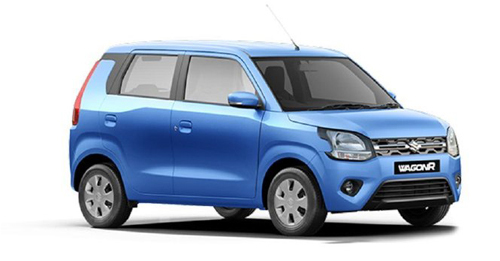 The 1.2-litre unit is the same motor which also powers the Swift, Ignis, Dzire and the Baleno. The new car's length, width and height figures now stand at 3,655mm, 1,620mm and 1,675mm, respectively. With all seat's up, the new WagonR offers a boot space of 341 litres and with the 2nd row of seats folded, space can be increased to 710 litres. The fuel tank capacity is pegged at 32 litres. 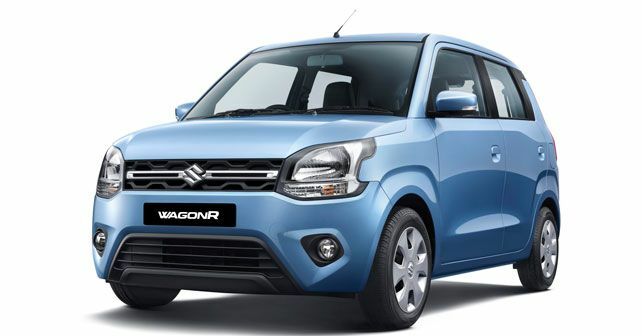 The 2019 WagonR has been launched in three variants, which will be offered in seven iterations: The base variant LXi, VXi and the top-spec ZXi. While the base variant is strictly available with the 1.0-litre petrol motor and manual transmission (LXi 1.0L), the mid-spec variant gets both the engine options as well as both manual and AMT (AGS) transmission options (VXi 1.0L, VXi AGS 1.0L, VXi 1.2L, VXi AGS 1.2L). the top-spec variant will be strictly available with the 1.2-litre motor but, with both transmission options (ZXi 1.2L and ZXi AGS 1.2L). In terms of features and interior changes, 2019 WagonR gets an all-new dashboard layout and design with a much-awaited 7.0-inch touchscreen infotainment system, dubbed as the 'SmartPlay Studio' which comes with Apple CarPlay and Android Auto connectivity. Other convenience features include power windows (front and rear), manual air-conditioning, steering-mounted audio and call controls and a rear wiper/defogger. However, the third-gen WagonR misses out on LED DRLs and alloy wheels. Safety features include dual airbags (only driver airbag available as standard), ABS with EBD, rear parking assist speed-warning indicator and front seatbelt reminders. Except for the dual airbag option, all the above-mentioned safety features are standard across all variants. Here's the variant-wise price breakup of the 2019 Maruti Suzuki WagonR (all prices mentioned below are ex-showroom, Delhi).